Although I’ve been eating kale for a long, long time (Marcella Hazan’s excellent Tuscan Peasant Soup was my “gateway drug” to this dark, leafy green), I’ve been firmly resisting the kale salad trend. And so kale always found three other eventualities: kale chips, soup, or green juice/smoothies. While I’m usually pretty good at resisting fashion trends (high-wedge sneakers, I’m talking to you), I tend to cave to food trends pretty quickly… curiosity always seems to win out. And unlike the Luther Burger or Double Down, kale salad seems to have some serious staying power. And so I finally caved. I only wish I’d done so sooner. While kale is tougher and more bitter than your average salad green, there’s a couple of tricks for making it work. First, a quick massage of the leaves will help soften and break down kale’s tough structure. 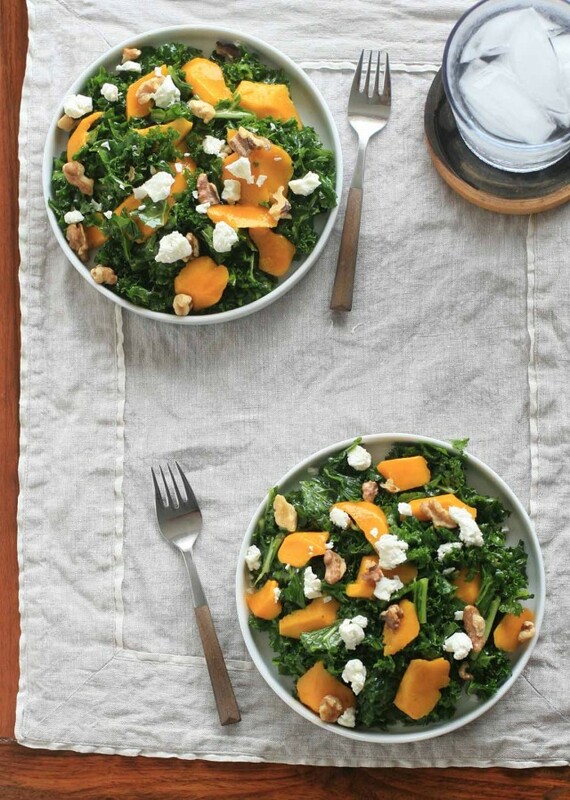 And pairing the kale with something extra sweet–like mango– will help balance the flavor. I made a couple iterations of this salad, using whatever fruit I had on hand. Peaches and mangoes were my favorite, but any sweet, ripe fruit should work well. 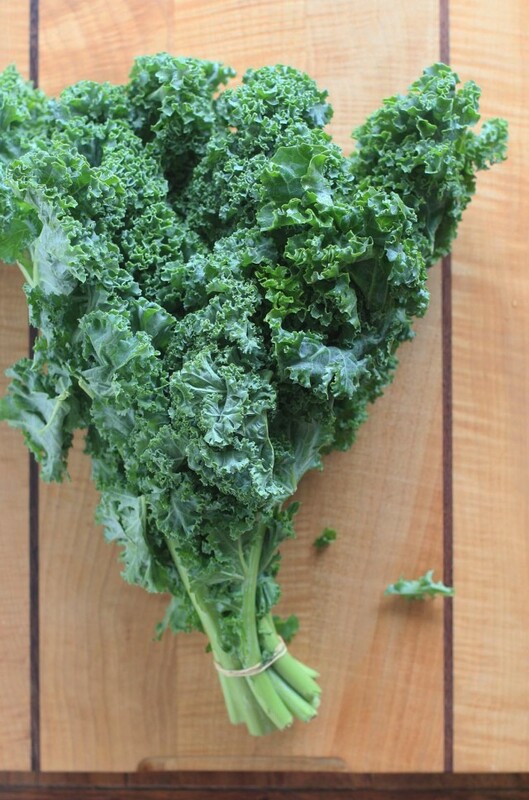 In large bowl combine the kale, a drizzle of olive oil, a Tablespoon of lemon juice, and a sprinkle of salt. Use your hands to massage the leaves until the kale starts to soften and wilt, 2 to 3 minutes. Set aside. In a small bowl, whisk together the remaining olive oil, lemon juice, honey and some freshly ground black pepper. Pour the dressing over the kale and toss to combine. 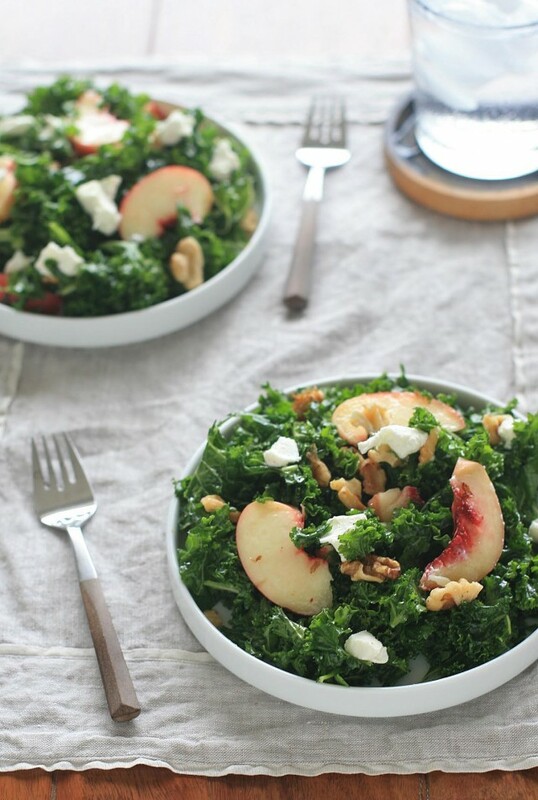 Transfer the kale mixture to four individual plates and top with the mango chunks, walnuts and goat cheese.